PRIP Bill Boyd presenting a Pride of Workmanship Certificate to Anita Greenland of The Professionals Real Estate. 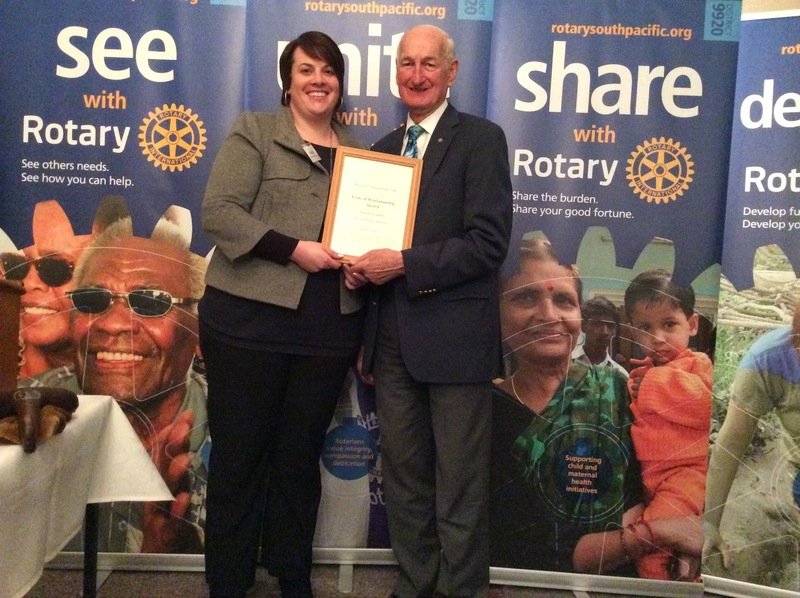 Successful recipients of the Rotary Club of Manurewa-Takanini’s Pride of Workmanship Awards. Front row (left to right): Anita Greenland, Stacey Upjohn, Vanessa Carney, Reena Kaur and Shareen Prakesh. Back row (left to right): Frank Vaotuua, Stephen Paparoa, Andrea Cottingham, Janice McFarline, Sam Kakato and Dimuth Peiris. Pride of Workmanship Awards were awarded by the Rotary Club of Manurewa-Takanini, NZ on September 21, 2015 to 11 awardees, including security guards, teachers, supermarket supervisors, a personal assistant, a secretary receptionist, a beverages and catering manager, an artist and a team leader. Their employers ranged from a primary school, beautification trust, real estate agency, supermarket, and a shopping centre to a local board and a golf club. Awardee nominations came as a result of personal contact with employers known to members, a mail-out to local businesses with a personal follow up, and from approaching a school principal who was a guest speaker earlier in the year. Every business has staff members who excel at their jobs or think outside the square to ensure that the duties they have been allocated are finished both accurately and on time. These same employees may volunteer to help other employees with their tasks. Many businesses value special employees, but due to financial restraints or company policies, they are unable to reward them for their extra efforts. The idea behind the Pride of Workmanship Awards is to help employers recognise these employees, so each year we select a small group of local companies to participate in these awards. The employers nominate their staff member along with a short resume of what they do and why they are nominating them. It is not a competition, so nominees are all automatically accepted by the club and certificates are printed and framed. The presentation dinner is attended by the employer and their nominated employee, plus any other employees the business wishes to bring along, or even family members. The Rotary club pays for the employee and the employer pays for themselves and any other people they bring along. We include a short speech about Rotary opportunities, then a keynote speaker on a related topic, and then it is the presentation of certificates with the employers explaining why they nominated each awardee. It is always a great night where we all recognise excellence and the recipients go home feeling appreciated. We recommend annual Pride of Workmanship Awards to all clubs.